Ready to take a classified national security payload and a batch of hitchhiking cubesats into space early Thursday (Aug. 2) from California, a United Launch Alliance Atlas 5 rocket is in the final days of preparations for blastoff. The middle-of-the-night launch is slated to occur at 12:40 a.m. local time (3:40 a.m. EDT; 0740 GMT) Thursday. The mission will originate from Vandenberg Air Force Base's Space Launch Complex 3-East, a "classic pad" with a retractable service gantry and fixed umbilical tower. The Vandenberg complex stands in contrast to the Atlas 5's launch site at Florida's Cape Canaveral, which assembles its rockets in an adjacent building and rolls the vehicles out to the spartan pad on a mobile platform. Thursday's trip to space will deploy another cargo for the U.S. National Reconnaissance Office (NRO), the secretive government organization responsible for designing and operating the intelligence-gathering surveillance spacecraft for policy makers and military forces. All details about the payload nestled inside the Atlas rocket's nose cone are kept classified. The agency will say only that the launch is known as NROL-36. "Any NRO launch is critical to national security, delivering new intel capabilities out to the warfighters," said Lt. Col. Dan Gillen, commander of the 4th Space Launch Squadron that oversees Atlas 5 and Delta 4 rocket operations at Vandenberg. "Even though we are winding down some operations in Afghanistan and Iraq, the need for intel is still growing." Once the primary payload is delivered into its hush-hush orbital destination, the Centaur upper stage will maneuver to a different altitude where 11 miniature satellites built by universities, the military and a national lab will be ejected from eight deployers all packed into one box-like container. That structure is attached to a bracket on the aft-end of the stage next to the RL10 engine where a helium bottle previously resided. Available performance on this mission made it suitable to fly the secondary cubesats and deliver them into a useful orbit. Four are flying through NASA's Educational Launch of Nanosatellite program (ELANA) that works with schools to give students real-life experience in the space business. Institutions launching their scientifically meaningful hardware on this rocket via ELANA are the University of California, University of Colorado at Boulder, California Polytechnic State University and Morehead State. In addition, the NRO's Mission Support Directorate is enabling seven satellites to fly from the Army Space and Missile Defense Command, the Aerospace Corp., the University of Southern California and the Lawrence Livermore National Laboratory. Objectives of the various spacecraft range from testing future satellite technologies, probing space weather and observing the cosmic X-ray background. The launch campaign began when the Atlas first stage and Centaur arrived at Vandenberg in April from ULA's production factory in Alabama. This is the most basic version of Atlas 5, known as the 401 configuration with a four-meter-diameter payload shroud, no strap-on solid-fuel motors and a single-engine Centaur. Stacking of the vehicle occurred in May as the bronze first stage, equipped with its kerosene-fed RD-180 main engine, was brought to SLC 3, rotated vertical and set onto the pad. Then the cryogenic Centaur got hoisted into position. Garrett Skrobot, a NASA manager on the ELANA project, said the cubesats were attached to the Centaur while the rocket was still horizontal in the hangar. 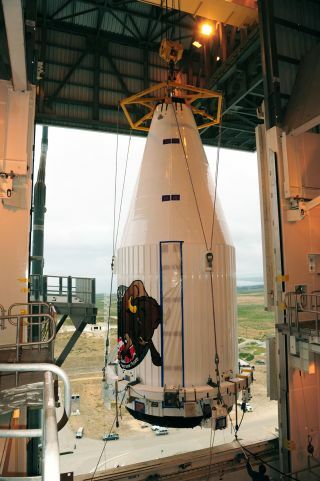 The primary payload was readied for flight elsewhere on base and encapsulated in the nose cone before riding a special transport trailer to the pad to join up with its launcher on July 17. "These activities we've been planning and prepping for years in advance starting back at the factory. This hardware has been performing remarkably well," Gillen said. Thursday's launch date has held steady on the calendar with no recent delays for this, the Atlas 5 rocket's 32nd flight in the past decade. "With every mission, we are always anticipating a lot of spectators because it's always a very exciting event," Gillen said. "I know because of the importance of this launch that there's a ton of invites out and I imagine that there will be many VIPs." The final launch readiness reviews were scheduled to be held Tuesday (July 31) to give approval for starting the countdown operations Wednesday afternoon. Retraction of the gantry to unveil the 19-story rocket occurs about four hours before liftoff time and fueling commences about two hours later. "Things are actually looking really good. We are on track. We are where we would hope to be, where we would expect to be at this point," Gillen said in an interview Friday. It will be the fourth of four launches for the NRO in 2012. A Delta 4 rocket put a radar-imaging satellite into a retrograde orbit from Vandenberg in April, an Atlas 5 carried a geosynchronous data-relay bird in June from Cape Canaveral, followed by a Delta 4-Heavy with a clandestine cargo also flown from the Cape in late June. As for the Atlas 5 program, the rocket will celebrate the 10th anniversary of its maiden mission on Aug. 21, the same day as rollout at the Cape for launching NASA's Radiation Belt Storm Probes on Aug. 23 at 4:08 a.m. EDT. Vandenberg will host launches of the next Landsat Earth-resources spacecraft in February and the commercial GeoEye 2 Earth-imaging satellite in April. Gillen's squadron at Vandenberg also has a much-anticipated Delta 4-Heavy rocket launch for the NRO slated for next August. "I'm anticipating a really good ops tempo and expect Team Vandenberg to stay very busy over the next year," he said. Hardware for all three of those 2013 missions will soon begin arriving at the base for processing.